There are so many procedures that repair damaged teeth today. So… how do you choose? With the help of our knowledgeable and friendly dental staff here at Ian Barwick, DMD, that’s how! 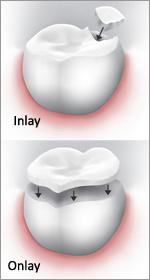 Inlays and onlays look very natural, so no one even knows they’re not your real molars! They are also strong and durable – necessary qualities for those busy back molars!